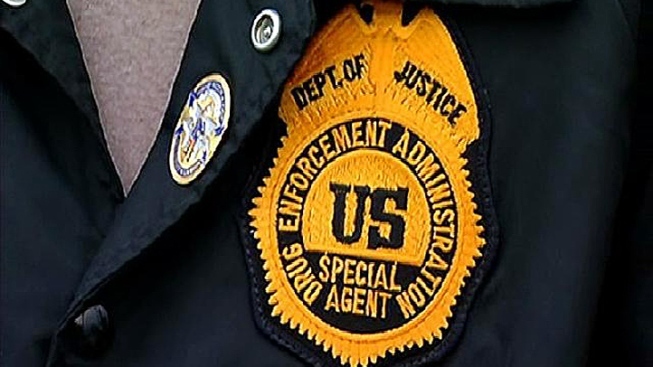 File image of a DEA badge. A San Jose man was arrested Saturday on charges of impersonating a federal agent while making illegal traffic stops on South Bay roadways, according to the Drug Enforcement Administration. Alex Taylor, 49, was arrested outside his home and booked on charges of pretending to be an federal officer, unlawful possession of official badges and possession of a counterfeit seal of an agency of the U.S. In December, Taylor was observed conducting unauthorized vehicle stops in a Volkswagen Jetta with "police type" lighting while wearing a gold DEA badge and identifying himself as a DEA agent, the agency said. According to court documents, one of the drivers Taylor pulled over was an off-duty federal agent in San Jose. During the encounter, the off-duty agent challenged that Taylor could write a ticket, which Taylor disputed. When the off-duty agent identified herself, Taylor returned to his vehicle and drove off, documents show. In late November, an off-duty Santa Clara County Sheriff’s deputy saw Taylor and his Jetta with flashing red-blue lights on southbound Highways 85 and 17 and notified the DEA. And in late February, the DEA was notified by the California Highway Patrol of reports of a Volkswagen Jetta driving with red-blue lights on, trying to pull over drivers in the area of southbound Interstate 280 and southbound Highway 85, the DEA said. On Thursday, DEA agents saw Taylor leaving his house wearing a gold badge around his neck that resembles the DEA badge and what appeared to be a gun on his right hip concealed under his T-shirt, the DEA said. Taylor was arrested the following morning. Agents seized the Jetta, two firearms, the imitation DEA badge and a "concealed weapons" badge, a pair of handcuffs and a small amount of methamphetamine, the DEA said. Anyone with information about the investigation should contact 408-282-3442.